I am the sort of person who doesn’t like going up for a raffle prize so quite what possessed me to walk into the offices of the local BBC Sussex radio station and within a few minutes find myself doing a brief interview I don’t really know. I was off to meet good friends for lunch in Brighton when I heard there was to be a phone in about Parkinson’s on the radio and I knew that I would be walking past the offices. I had enjoyed a rare good night’s sleep and was feeling pretty good so maybe that would explain why I walked into the reception area to wish them luck and was suddenly transported into the studio being interviewed by Danny Pike. The questions he asked were not ones I was expecting but I hopefully gave coherent replies which erred on the side of the positive, all quite exciting. I had managed to phone a very surprised husband who listened to the broadcast after phoning a few friends. Afterwards when I walked into the restaurant I enjoyed a few minutes as a celebrity and we had a very lovely and loud lunch! Don’t forget, socialising is good for us Parkinson’s sufferers! My second foray into publicity and Parkinson’s came when I went to my dance class this week. Graham Tilley was filming dance material inspired by English National Ballet’s “Voices of America” repertory at three of English National’s Dance for Parkinson’s hubs to create a short film for World Dance for Parkinson’s Day on April 29th. Everyone worked really hard and hopefully it will inspire others to try dance; we had a wonderful class filled with laughter and fun. I came out of the session feeling really energised with certainly no thoughts of having a chronic illness. Recently I was on my way to the dance class in London when I realised I was rather early so I had a wander around St Mary’s Abbot’s church. I sat down for a few minutes and suddenly became aware of a presence. When I looked around I realised a little tabby cat had joined me and was purring loudly. He had a collar and bell so maybe he is a church cat? I have discovered a connection with St Getrude of Nivelles, the patron saint of cats and those who love them, I will return to find out more! As I moved away the cat made his way round all the pews perhaps giving comfort to those there. I love cats and am looking forward to looking after my son and daughter in law’s while they enjoy a well deserved holiday. March has been a strange month. Snow and bitterly cold wind made staying in look quite attractive, I even managed to tidy out my spice cupboard and throw away all those way past their sell by dates. Amazing Mum – first TV, now a radio and film star! Another interesting and inspirational blog Elspeth. 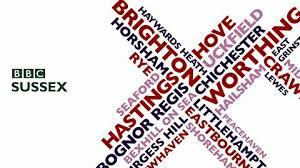 Your comments on Radio Brighton will certainly have helped many other sufferers and will hopefully encourage them see the benefit of exercise and continuing to live life as normally as possible, despite the many challenges. Great to hear you have now booked your visit to see your lovely family in Melbourne. Please tell how I can listen on catch up – ! Wow, well done indeed. What an exciting time! Probably it is no bad thing to act on the spur of the moment. Wish I had been able to hear your interview. I am sure it was very positive and up-beat. Life is just a whirl for you isn’t it? No time to think of illness. Keep up the good work.